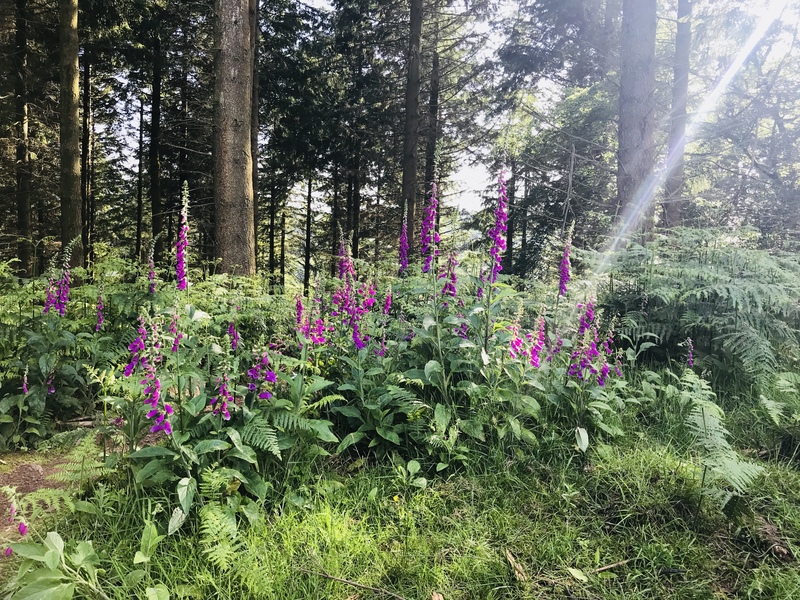 If you’ve been out wandering in the woods or countryside, the chances are you’ve spotted the tall, colourful foxglove which is in bloom in the warm months of June and July. These flowers aren’t just beautiful to look at, they’re also a source of food for many species and the original source of some of the life-saving medicines we have today. But they also have a dark side: every part of the plant is deadly toxic, so while they are very attractive, don’t eat, pick or touch them! Foxgloves are a common plant across most of Europe, and also in parts of North America. 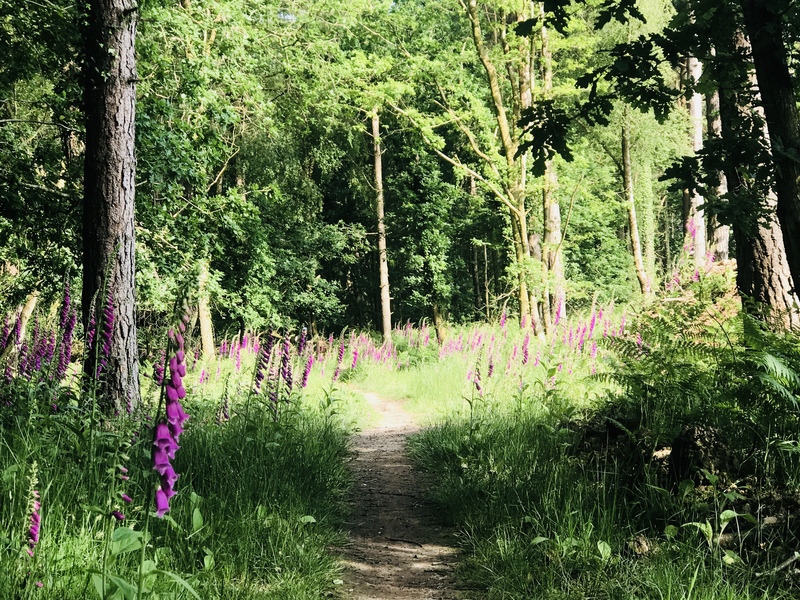 There are lots of different species of Foxglove but the most common one you’ll see when you’re out and about is called Digitalis purpurea. Digitalis means ‘finger-like’ and could have arisen because the bell-like blooms on the central stem are big enough to put your fingers into! Probably best not to though and if you do, make sure you wash your hands afterward! The plants can survive in a lot of different conditions but like acidic soils and partial sunlight or deep shade. This means you’ll often find them in woods, cleared area of woods, around the edges of fields in hedgerows, mountain slopes, and moorland. 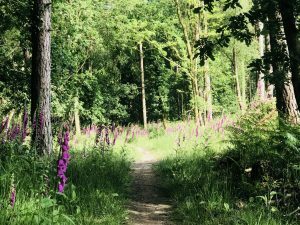 They often do particularly well in areas where the ground has been disturbed so you’ll often find great, beautiful swathes of them in cleared woodland, so Forestry Commission woods are a good place to spot them. What feeds on the Foxglove? 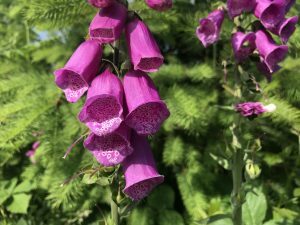 If you watch a Foxglove for any length of time, the chances are you’ll see a bee disappear into one of the bell-like blossoms to gather nectar. They are a great source of food for pollinating insects like bees, which are in turn essential for life on earth! In fact, those bell-like flowers have evolved for a specific purpose: because the bee has to go right inside to reach the nectar, it’ll have to rub close against the pollen inside the flower too! Then when it visits the next plant, some of that pollen will rub off and pollinate that flower, while it picks up more pollen along the way. It’s not just about the flowers though. Several species of moths and butterflies will lay their eggs on the plant, and the caterpillars will much away on the leaves and flowers. The Foxglove pug moth larvae eat the flowers, and the lesser yellow underwing the leaves. 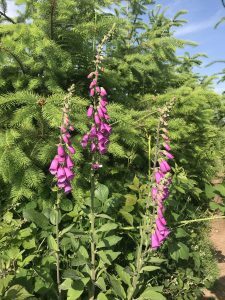 While the plant itself is deadly, scientists have discovered that some of the natural chemicals within the common Digitalis purpurea have amazing medical properties. These include a range of medicines called ‘digitalins’, after the scientific name for the plant. These are used to treat irregular heartbeat, called arrhythmia, and also heart attacks. These are life-saving medicines. Foxglove is only one name for this beautiful wildflower. In Welsh, it’s ‘Maneg Ellyllyn’ which means ‘The Good People’s Glove’, with ‘good people’ in this case referring to fairies! So they’re called fairy gloves in Welsh. Other names also reference fairies such as ‘folksgloves’ and ‘fairy bells. Since they also look like thimbles, a lot of other countries reference this in their names for the plant such as Denmark (‘Fingerbøl’), Sweden (‘Fingerborgsblomma’) and Finland (‘Sormustinkukka’). It’s also known as ‘Witches glove’ in some places, which hints at its poisonous nature.